Boston Marathon Explosions: Thursday's Developments : The Two-Way Clues are still being sifted — most notably, perhaps, from video that shows a man setting down a bag and leaving the scene. No arrests have been made. Thursday morning, President Obama is at an interfaith service in Boston where the victims will be remembered. Note: We're following Friday's breaking news — that one suspect is dead and that police are searching for the other — in a new post. 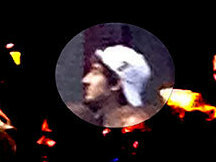 The FBI released this photograph of a man they are calling a suspect in the Boston Marathon bombings. EMERGENCY DECLARATION: "President Obama has signed an emergency declaration for the state of Massachusetts — a move that frees up federal funding to help with crisis management," WBUR writes. INTERFAITH SERVICE: At service Thursday morning in Boston's Cathedral of the Holy Cross, leaders from a cross-section of faiths spoke about the horror of the bombings — and the heroism and selflessness of those who rushed to help. President Obama, who assured the people of Boston that the nation stands with them and said to those responsible for the attack that "we will find you," was there with first lady Michelle Obama. Mitt Romney, the 2012 Republican presidential nominee and a former governor of Massachusetts, is in attendance. We've put a copy of the program for the service below. NPR's Tom Gjelten tells our Newscast unit that what struck him about the press conference is that the FBI is now calling these two men "suspects." Even Homeland Security Secretary Janet Napolitano called them people of interest during her testimony earlier today. This change in terminology, said Tom, means the "FBI now suspect the men of being responsible for this bombing at the Boston Marathon." Tom also points out that the men ended up at the two bomb sites separately, but earlier they were seen walking close to each other. We've added one of the images released by the FBI at the top of this post. The agency has posted 10 others on its website. The FBI is asking the public to call 1-800-CALL-FBI, if they have any information about the suspects. "Somebody out there knows these individuals as friends, neighbors, co-workers or family members of the suspects. Though it may be difficult, the nation is counting on those with information to come forward and provide it to us," DesLauriers said. He also added that no one should try to apprehend them, because they are presumed to be "armed and extremely dangerous." DeLauriers said that only one of the suspects is seen dropping off a bag near the scene of the explosion. "We know the public will play a critical role in identifying the individuals," DeLauriers said. But he warned that people should not try to apprehend them, because they are "armed and extremely dangerous." FBI Special Agent in Charge Richard DesLauriers says the FBI has identified two suspects. DesLauriers is showing images of two men. One of them is wearing a black hat the other is wearing a white hat. An FBI news conference is scheduled to begin at any minute now. NPR will carry it live. We're expecting the FBI to release photographs of two men they are interested in speaking to. We'll post those pictures as soon as we get them. An official familiar with the investigation tells NPR that the FBI is interested in speaking to two men seen in photos or videos of the scene near the finish line at the race. According to the official, the FBI will release photos of the men during the press conference. Both men are described as being in their 20s. Like Homeland Security Secretary Janet Napolitano, the FBI has not described them as suspects. "Boston hospitals reported seven people in critical condition on Thursday, down from 14 on Wednesday." According to CNN's count, about 60 people remained hospitalized. No doubt one of the threads that we will follow for a long time to come will be the recovery of the bombing victims. As we've reported, many of them lost limbs in the attack. WBUR spoke to Tracey Dechert, a trauma surgeon at Boston Medical Center, about the gut-wrenching decision to amputate. She explained that in a lot of ways making the decision quickly can be better in the long run. It's still doesn't make the decision any easier. "Of course you would want everyone to have all their limbs," Dechert told WBUR. "And even though you know down the road this is the best thing for them given the situation, it's still very sad, obviously, though." On the same thread, The New York Times has a piece about how sports and war have inspired better design in prosthetics. The paper reports that 1,600 Americans lost limbs during the war in Afghanistan and Iraq. "Now, the vast body of knowledge gained from treating those troops is likely to help speed and improve the recovery of people whose limbs were amputated after Monday's attack," the Times reports. The FBI has scheduled a news briefing for 5 p.m. in Boston. Of course, this is bound to change. If you remember, yesterday, the FBI scheduled press conferences but eventually called them off. "We will find you and yes, you will face justice," the president promises the person or persons responsible for the bombings. "Small, stunted individuals who would destroy instead of build and somehow think that makes them more important" don't understand that "a bomb can't beat us," Obama adds. "We will keep going ... we will finish the race," he also says, just like 78-year-old Bill Iffrig, the runner who the world saw get knocked over by one of the bomb blasts. Iffrig picked himself up and finished the last few yards of the marathon. "We may be momentarily knocked off our feet, Obama says, "but we will pick ourselves up." After his address, those in attendance sang "America the Beautiful" and the service came to a close. The president gets a standing ovation when he says that if "whomever committed this heinous act" thought they could intimidate or terrorize anyone, "they picked the wrong city to do it!" Boston, Obama says, will "stand and walk and yes, run again ... of that I have no doubt.. ... You will run again because that's what the people of Boston are made of. Your resolve is the greatest rebuke to whomever committed this heinous act." The president begins his remarks at the interfaith service by speaking of the beautiful day in Boston that in an instant, "was shattered." "A celebration became a tragedy," Obama says. His message, the president continues, is that "every one of us has been touched by this attack on your beloved city. Every one of us stands with you." His faith, says Massachusetts Gov. Deval Patrick, teaches that "in everything, give thanks. That isn't always easy to do." But after Monday's "cowardice," he found reasons to give thanks — for the first responders, the volunteers, the medical professionals, the police and most of all, the people of Boston who "let their first instinct be kindness." "The grace this tragedy exposed is the best of who we are," Patrick added just before introducing President Obama. Monday's "act of senseless violence" is a reminder of the "darkness that can lurk in the human heart," says Cardinal Sean O'Malley, head of the Roman Catholic Church in Boston. But the way so many reacted is a reminder that "there resides in people's hearts a goodness that is incredibly selfless," he says. The cardinal is to be followed at the interfaith service by a performance from cellist Yo-Yo Ma. The Gospel reading is from Matthew 5:1-12, and is read by Bishop John M. Borders III of Morning Star Baptist Church in Mattapan, Mass. Update at 11:38 a.m. ET. "Up To The Mountain." A very emotional moment at the interfaith service: As the Boston Children's Chorus sings Patty Griffin's "Up to the Mountain," tears flow down the cheeks of one young singer's cheeks. The interfaith service continues. Even as God "allows hatred and fanaticism to have its moment, says Rev. Roberto Miranda of Congregación León de Judá in Roxbury, Mass., "in the end, goodness will always prevail. ... Weeping may stay for the night, but joy comes in the morning." Reminder: We've posted the program for the interfaith service below. Nasser S. Wedaddy, chair of the New England Interfaith Council and civil rights outreach director at the American Islamic Congress, also praises those "who stepped forward" and says "we all have service to perform. ... To heal, to rebuild and to serve once again as a shining city on the hill." Rabbi Ronne Friedman of Boston's Temple Israel includes a mention of those killed and injured Wednesday night in West, Texas, where a fertilizer plant exploded. "Our arms are wide enough to hold you as well," he says. At the interfaith service, Rev. Nancy Taylor of Old South Church tells how her place of worship holds a service for Boston marathoners each year. The church sends the runners off with these words from the Prophet Isaiah: "May you run and not grow weary, may you walk and not grow faint." On Monday, she says, she saw marathoners running "toward the danger" and sacrificing themselves for others. His voice choking, Mayor Thomas Menino (D) says that after the bombings, "love has covered this resilient city. I have never loved it and its people more than I do today." He praises "the brave ones who felt the blast and still raced to the smoke." The love and the bravery gives those in Boston, the victims and their families the strength to carry on, he says. "We triumphed over that hateful act," Menino adds. Reminder: We've posted the program for the interfaith service below. After praying for the victims, Eminence Methodios, head of the Greek Orthodox Church in Boston, thanks God "for the police and firefighters, the National Guard, for the doctors and nurses, for all who responded selflessly and courageously." "Through the blur of each other's tears, we will rise in one community ... resolutely, as one," says Rev. Liz Walker of Roxbury Presbyterian Church, as she opens the interfaith service. The president and first lady Michelle Obama just took their seats in Boston's Cathedral of the Holy Cross. WhiteHouse.gov is among the websites streaming coverage of the service. "Homeland Security Secretary Janet Napolitano says the FBI wants to speak with two men seen in at least one video from the Boston Marathon, but she says she isn't calling them suspects," The Associated Press reports. The wire service adds that "without providing details of the men's appearance or what the video shows, Napolitano told the House Homeland Security Committee on Thursday that 'there is some video that raised the question' of two men the FBI would like to interview but said she wouldn't described them as suspects. Napolitano said it's still unclear whether the bombs that exploded near the finish line of the Boston Marathon were the work of foreign or domestic terrorists. She said the investigation is continuing 'apace.' "
Reporters traveling with the president, including NPR's Ari Shapiro, report he plans to spend some time today meeting with people who were injured in the bombings and with the first responders who rushed to help the victims. There were people in line as early as 5 a.m. ET for the interfaith service, WBUR reports. The program for this morning's service shows it will begin with the hymn "Praise to the Lord, the Almighty," that the Boston Children's Chorus will sing Patty Griffin's "Up to the Mountain" and that there will be "reflections" from both Massachusetts Gov. Deval Patrick and President Obama. 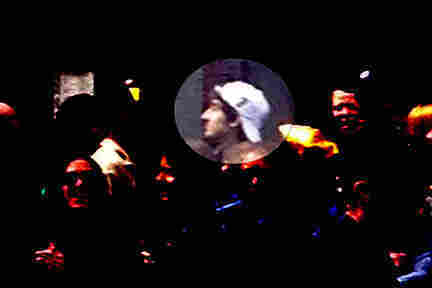 "Authorities have clear video images of two separate suspects in the Boston Marathon bombings carrying black bags at each explosion site and are planning to release the images today in an appeal for the public's help in identifying the men," The Boston Globe reports. It cites "an official briefed on the case" as its source. Note: As happens when stories such as this are developing, there will likely be reports that turn out to be mistaken. Wednesday, for example, there were reports from CNN, the AP, WBUR and others that authorities either had arrested a suspect or were about to do that. It turned out that no one had been arrested or taken into custody. We will focus on news being reported by NPR, other news outlets with expertise, and statements from authorities who are in a position to know what's going on. And if some of that information turns out to be wrong, we'll update.